The most often heard guest question has to be. "What is the best thing on the menu?" Well if there was a fire and we were forced to rescue just one recipe, it would have to be the Jayne Burger. One thing we know here at Jaynes is our burger. We've nailed the recipe and it will never leave menu. Sara Hanson "Superdiner" from the Sarkus wine blog gave us a nice nod in the Union Trib Column on the city's best burger today. She describes our burger thusly: "Jayne’s Gastropub wins for highest quality and most consistent. They use all-natural, hormone/antibiotic-free Niman Ranch ground beef—topped with Vermont cheddar and garlic aioli. 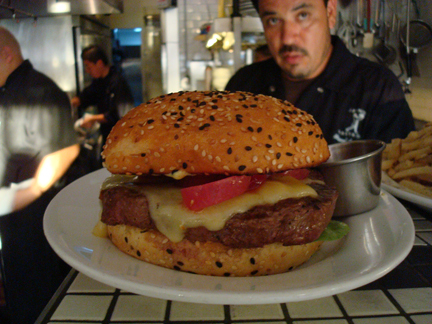 But the real secret is Jayne’s house-made pickled onions, which give the burger an auxiliary sweet-&-salty component." Thanks for noticing Sara. The onions are indeed one of the great assets of the Jayne Burger. We urge all to try the burger in its original form without any modifications. We'll happily prepare it rare to well done. Tuesday is the best night to come try it. $16 for the Jayne Burger and any draft beer. The Jayne Burger is served with a heaping portion of our hand cut double cooked Kennebec fries. We also feature a 1/2 size version with fries during our happy hour for only $5 which may just be the best happy hour meal in the city.